Quartz Valley Indian Community (Klamath, Karuk (Karok), and Shasta (Chasta) people), California. The Klamath people lived in the area around the Upper Klamath Lake and the Klamath, Williamson, and Sprague rivers. They subsisted primarily on fish and gathered roots and seeds. While there was knowledge of their immediate neighbors, apparently the Klamath were unaware of the existence of the Pacific Ocean. Gatschet has described this position as leaving the Klamath living in a "protracted isolation" from outside cultures. The Klamath were known to raid neighboring tribes, such as the Achomawi on the Pit River, and occasionally to take prisoners as slaves. They traded with the Wasco-Wishram at The Dalles. However, scholars such as Alfred L. Kroeber and Leslie Spier consider these slaving raids by the Klamath to begin only with the acquisition of the horse. These natives made southern Oregon their home for long enough to witness the eruption of Mount Mazama. It was a legendary volcanic mountain who is the creator of Crater Lake, now considered to be a beautiful natural formation. In 1826, Peter Skene Ogden, an explorer for the Hudson's Bay Company, first encountered the Klamath people, and he was trading with them by 1829. The United States frontiersman Kit Carson admired their arrows, which were reported to be able to shoot through a house. 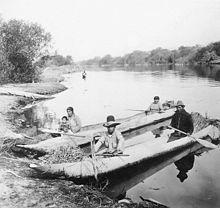 The Klamaths, Modocs, and the Yahooskin (Yahuskin) Band of Northern Paiute (in Paiute known as: Goyatöka - "Crayfish eaters"), which was erroneously called Upper Sprague River Snakes believed to be a Band of Snake Indians, the collective name given to the Northern Paiute, Bannock, and Shoshone Native American tribes, signed a treaty with the United States in 1864, establishing the Klamath Reservation to the northeast of Upper Klamath Lake. This area was largely part of the traditional territory controlled by the ă′ukuckni Klamath band. The treaty required the tribes to cede the land in the Klamath Basin, bounded on the north by the 44th parallel, to the United States. In return, the United States was to make a lump sum payment of $35,000, and annual payments totalling $80,000 over 15 years, as well as providing infrastructure and staff for the reservation. The treaty provided that, if the Indians drank or stored intoxicating liquor on the reservation, the payments could be withheld; the United States could also locate additional tribes on the reservation in the future. The tribes requested Lindsay Applegate as the agent to represent the United States to them. The Indian agent estimated the total population of the three tribes at about 2,000 when the treaty was signed. Since termination of recognition of their tribal sovereignty in 1954 (with federal payments not disbursed until 1961), the Klamath and neighboring tribes have reorganized their government and revived tribal identity. The Klamath, along with the Modoc and Yahooskin, have formed the federally recognized Klamath Tribes confederation. Their tribal government is based in Chiloquin, Oregon. Some Klamath live on the Quartz Valley Indian Community in Siskiyou County, California. The towns are not isolated, compact groups of houses, but stretch along the banks for half a mile or more. In fact, the settlements on Williamson river below the Sprague river junction form a practically continuous string of houses for five or six miles, the house pits being, in many spots, crowded close together. Informants insisted that many of these were occupied at the same time. When we consider that these earth-lodges may have housed several families, there is strong suggestion of a considerable population. Marriage was a unique practice for the Klamath, compared to neighboring cultures found in the borderlands of modern Oregon, California, Nevada and Idaho. 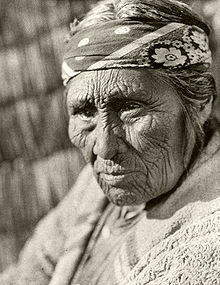 For example, unlike the Hupa, Karok, and Yurok, the Klamath didn't hold formal talks between families for a bride price. Especially notable was the cultural norm that allowed wives to leave husbands, as they were "in no sense chattel ... and certainly cannot be disposed of as a possession." The Klamath use Apocynum cannabinum as a fiber and eat the roots of Lomatium canbyi. They use the rootstocks of Sagittaria cuneata as food. The septum of the nose is pierced and the ear lobes, the latter twice or even more frequently. Both sexes insert dentalium shells horizontally through the septum ... Ear pendants are a group of four dentalia hung in a bunch by their tips. The use of dentalium in septum piercings, in addition to other means of ornamentation, was common among the Wasco-Wishram as well. The Klamath people are grouped with the Plateau Indians—the peoples who originally lived on the Columbia River Plateau. They were most closely linked with the Modoc people. The Klamath spoke one dialect of the Klamath–Modoc language - the northern or "fi-ukshikni" dialect, the other - the "southern" dialect being spoken by the Modoc people, who lived south of the Klamath. Once thought to be a language isolate, Klamath–Modoc is now considered a member of the Plateau Penutian language family. Both the Klamath and the Modoc called themselves maqlaqs, maqlags or Maklaks meaning "people". When they wanted to distinguish between themselves they added knii ("people from/of"), the Klamath were called ?ewksiknii, "people of the [Klamath] Lake", and the Modoc were called moowatdal'knii, "people of the south". A fictionalized account of historical events surrounding the 1961 tribal termination can be found in the 2005 Rick Steber novel Buy the Chief a Cadillac, winner of the 2005 Spur Award. ^ Gatschet 1890, p. lvi. ^ Wheeler-Voegelin 1955, p. 97. ^ Coville 1897, pp. 102-103. Annual report of the Commissioner of Indian Affairs to the Secretary of the Interior for the year 1865: Reports of Agents in Oregon Washington: United States Office of Indian Affairs, 1865. Hale, Horation. "The Klamath Nation: the country and the people". Science. vol. 19, no. 465, 1892. Hodge, Frederick Webb. Handbook of American Indians north of Mexico. Washington: Government Printing Office, 1907. Wikimedia Commons has media related to Klamath. Wikisource has the text of the 1911 Encyclopædia Britannica article Klamath. This page was last edited on 24 November 2018, at 23:29 (UTC).